Take your slot gaming out of this world with Starburst slots. Its space-based theme is a glittering new attraction on Wink Bingo, with beautiful modern graphics and a timeless gameplay model that ties in both dazzling jewels and even more dazzling prizes. 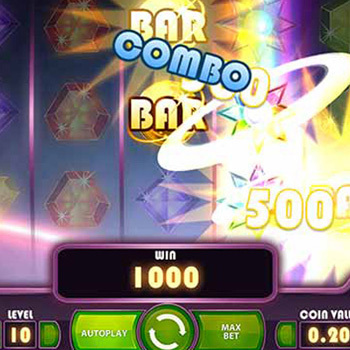 Starburst is a high energy classic video slot that brings the arcade atmosphere to the masses. This Netent production is fast paced, vibrant and bursting with colourful action. 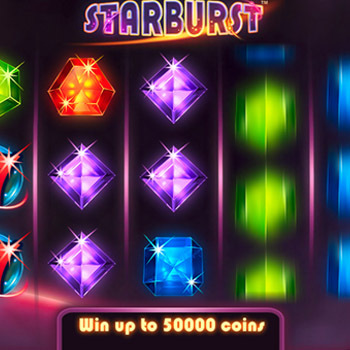 Rather than following a narrative or movie theme, Starburst is comprised of dazzling gemstones and intergalactic shining stars that need to be lined up in order to create a win, reminiscent of traditional fruit machines. 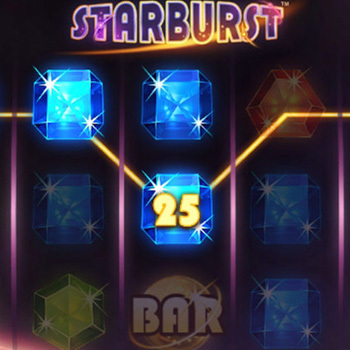 Like all the best slots, Starburst also contains enthralling bonus rounds, scatter symbols and wilds. This simple formula combined with all the latest gaming technology are what makes Starburst one of the most popular online slots games out there! For a traditional slot, Starburst packs in plenty of punch and excitement. You will find 10 win lines, 3 rows and 5 light-speed spinning reels that are filled with sparkling stars and glittering jewels. The hi tech graphics are 3 dimensional and make you feel like you are literally journeying through space! You are also more likely to feel like a champ, as Starburst’s wining lines run from right to left as well as from left to right, giving you the chance of winning up to 50,000 coins.The unique stacked symbols feature allows a stacked formation to appear on the reels at any given time. In order to land a win, all that is required is for a minimum of 3 symbols to be stacked, one on top of the other. Starburst also introduces an innovative new type of Wild which may appear over reels 2, 3 or 4, exploding over the entire reel and remaining in place for up to 3 re-spins, at no extra cost! The action doesn’t end there, the Wild symbol can also activate the Re-spin feature, which provides yet another round of spins and multiple winning combinations, which can yield prizes up to £200 in value. Evidently, this game is built to provide huge possibilities for success! No online slot would be complete without a bonus game. Starburst happens to offer two exciting bonus rounds which will have you gleaming like the stars. The Starburst Wilds bonus game is activated whenever your wild symbols show up on the middle three reels. The wilds explode, filling all the reels with additional wilds and a re-spin. If you happen upon another wild symbol during your re-spin, this leads to yet another re-spin. This cycle can keep on going, providing you with up to 5 spectacular re-spins. This bonus round is high octane and can provide some significant wins! The second Starburst bonus game is aptly named, Win Both Ways. No matter which way your winning combination lands on the reels, you are always rewarded with the corresponding payout, no matter whether the combination appears from right to left or left to right! Because there are so many winning combinations, it is advisable to review the game’s pay table to learn about individual prize amounts for each win. Alternatively, for a quick view, you can also hover over the various symbols to receive corresponding info. Win Both Ways bonus round can have you winning from all directions! If you like your slots super charged and high energy, then Netent’s Starburst is definitely the game for you. The game is straightforward yet it’s also fun and action packed, making it suitable for all levels of players. This futuristic online slot will take your breath away and, whether you have a winning round or not, you will still succeed in reaching maximum levels of enjoyment and adventure!